So I patched together a Railgun, using the amazing Dart Rifle by Solarius Scorch (<--LINK). - battlescape sprites, held and on floor. It's intended to be a sniping weapon (basically uses the stats of UFO2000's Sniper Rifle). Tested on OpenXCOM build: "openxcom_git_master_2014_02_15_1025.zip", and everything seems to work as intended. Let me know if cataclysm. Ruleset is rewritten on Solarius Scorch's Dart Rifle ruleset. Ammo clip is recolored version of DartRifle Clip, provided by Dioxine. Thanks Ryskeliini for the hints about how to mod. Many thanks for your nice words, but the Dart Rifle wasn't made by me. It's the Harpoon Gun from Terror from the Deep, and I wasn't even the person who ripped it (it was Dioxine). I just made the ruleset. As for your rifle, at first glance it seems good. You're one of the few modders whose weapons aren't completely OP. I think it might actually be a little too weak, but it depends when you can access it. Amny thanks for your nice words, but the Dart Rifle wasn't made by me. It's the Harpoon Gun from Terror from the Deep, and I wasn't even the person who ripped it (it was Dioxine). I just made the ruleset. Consider I'm using a ruleset which (or at least try to) re-balances the weapons, my Heavy Plasma for example deals 80 damage (instead of default 115), the intended drawbacks of the Railgun are: small clip size, lack of autoshot, and relative high cost. You can obtain it fairly quickly, and at this point you may think it is overpowered; but again my ruleset also makes several aliens resistant or more resistant to AP damage, so the Heavy Plasma with its lower damage is still a better "all-purpose" weapon. This is all on paper of course. The only change I'm thinking, is to raise the Aimed Shot TUs cost to 75% (so the same as the rocket launcher; or maybe a little lower at 70%). Made the sprites. Download at the bottom of the first post. Very interesting look. Quite original! Railguns and mass acelerator weapons isnt the gauss tecnology from tftd? They both use magnetic force. The difference AFAIK is that Railgun pushes a sort of sled-bracket (which is the element susceptible to the magnetic force) that in turn pushes the projectile (which is magnetically inert); Gauss pushed directly the "naked" projectile (which is itself the element susceptible to the magnetic force). But I may very well be wrong. This railgun will take his place in my armament ! 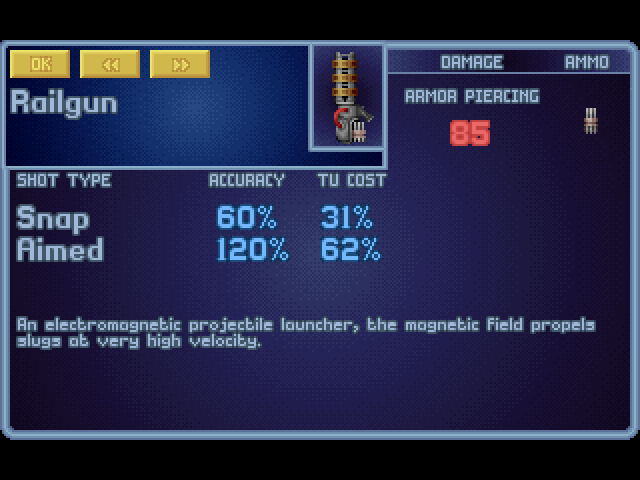 STR_RAILGUN_UFOPEDIA: Un lanceur electromagnetique propulsant ses munitions avec une fulgurance destructrice. STR_RAILGUN_UFOPEDIA: Un lanceur électromagnétique propulsant ses munitions avec une fulgurance destructrice. You should re-name everything in this mod because it conflicts with the mass accelerator weapons mod since they are both named "railgun" for some reason. You'll have to re-write all this but it didn't work when I just tried to change the name everywhere it said "railgun" (even config too). STR_RAILGUN_UFOPEDIA: Импульсный электродный ускоритель масс. Магнитное поле разгоняет снаряды до чрезвычайно высоких скоростей. If the string is the same in both cases (for exmaple STR_RAILGUN, or STR_RAILGUN_CLIP), the game will still try to combine them and there will be issues.